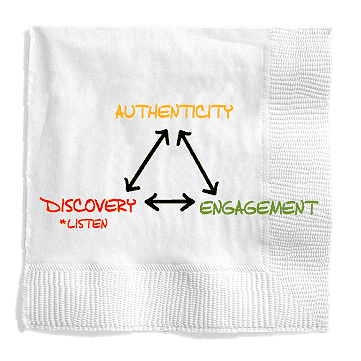 The are three key components to a great presentation: Engagement, Discovery and Authenticity. Our goal on the visit is to get people ENGAGED – in a dialogue – about them, about you, and about the opportunity you both have to save, change, and impact lives. Asking questions is the best way to do DISCOVERY. It is the best way to create ENGAGEMENT and an absolutely marvelous way to be able to PRESENT THE OPPORTUNITY! Focus. Actually sit up, and engage with your eyes and ears as you focus on exactly what the prospect is saying. Take notes. In my mind, this is a great way to show respect, show that you’re listening, and show that you care. The best thing about notes for me is that it helps me focus on listening, and then when the prospect is finished I can refer back to the notes and quotes. For even more, read the article 8 More Steps to Positive Listening Skills! AUTHENTICITY means being REAL. HONEST. CANDID. SINCERE! The people you’re with know right away whether you’re ‘selling snake oil’ or SINCERELY PRESENTING AN OPPORTUNITY that has VALUE to both the GIVER and the RECEIVER! I read 30 years ago (in Denis Waitley’s Seeds of Greatness) that the word SINCERE means “without wax” (in Latin, sine = without, cera = wax.) Ancient sculptors would ‘fix’ any flaws or mistakes that they made in the marble by filling in the mistake with wax.You can only be you. So go without the wax!